New and different technologies will be applied at the third station of the Purple Line (B3) being constructed in Baku. 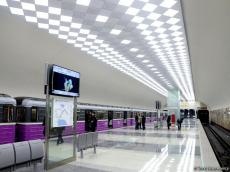 Bakhtiyar Mammadov, the head of the press service of Baku Metro Closed Joint-Stock Company (CJSC) reported that there will be a substantial change in the movement of train after the commissioning of the station. “First of all, trains will be able to move from one line to another after the commissioning the station. At present, trains are moving between two stations; Avtovagzal and Memar Ajami. Rotation cameras with 193.91 meters long are being constructed in the next area of the 3rd station with a total length of 370 meters,” he said. The representative of the company informed that currently, construction work have been completed in complex. “Communication lines, cable collectors, station equipment have been handed over to trowel masters. The opportunity has been created in order to carry out coating work on the traffic wall and the floor of the station. The surface of the wall has been made of ceramic granite, and the granite was laid on the floor. At the next stage, installation works will be started,” he added. Mammadov noted that the length of the station will be 166.98 m. B3 is intended for trains with seven carriages like other two stations of line. Moreover, he mentioned that the construction of two water reservoirs and pumping station, as well as ventilation system in the station is being completed. Thus, 40 percent of the main work on the internal ventilation system was fulfilled. The station will consist of tree levels. Elevators will also be installed here for disabled passengers. Moreover, 17 escalators will also serve passengers to get to the station. Mammadov concluded that at present, more than 1,300 meters of roads are laid. The length of the road is 1,259 meters in one tunnel and 1,281 meters in the other one. The construction of this station is expected to be completed by the end of 2019 or early in 2020. Baku Metro, opened in 1967, was the first subway system to be launched in the East. Serving the residents and guests of the capital for more than 50 years, Baku Metro is the most affordable and safest way to get around the city. Having 25 stations on three lines – Green, Red and Purple – the Baku Metro is 36.63 km in length. By 2030, it is planned to expand the infrastructure of Baku Metro and create a giant underground transport network consisting of 76 stations, 6 electric depots, and 5 lines with a total length of 119.1 kilometers.